Melissa Meyers is called a lyrical abstractionist. She paints free-floating, painterly ribbons of vibrant colors and shapes with oil paint thinned to the transparency of watercolor. She draws with paint. I visited the exhibition Melissa Meyers: New Paintings (November 1-December 22, 2018) at Lennon, Weinberg Inc., 514 West 25 Street, N.Y. the week before it closed. 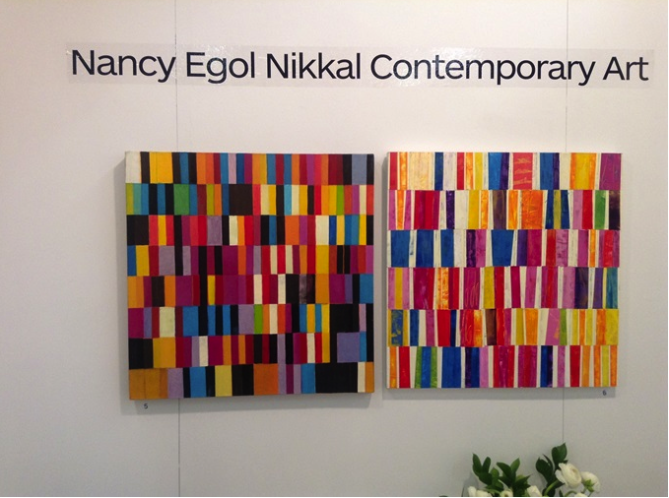 The exhibition included large paintings, several smaller diptychs and one collage. This is Meyer’s fifth solo exhibition at Lennon, Weinberg, Inc. The paintings are bold and vibrant. The image above, titled Summer in the City I, is oil on canvas (2018), 80 x 60 inches (image courtesy Lennon, Weinberg, Inc.). It’s a grid with calligraphic glyphs drawn with a paintbrush with thinned oil paint in different colors. Notice there are patches of palest, almost transparent pink and yellow below the painted glyphs. The image above is titled Draw the Line (2015) oil on canvas, 72×96 inches (image courtesy Lennon, Weinstein, Inc.). Here, the background is a patchwork of warm and cool whites with a second layer of warm and cool blacks painted in a calligraphic design. John Yau, who wrote a review for Hyperallergic, is a big fan, and has reviewed many of Meyer’s solo exhibitions at Lennon, Weinberg, Inc. He said: “When Meyer started using oil paint that was closer in consistency to watercolor, she broke through into a territory that is now all her own.” See his review (November 25, 2018) at hyperallergic.com. 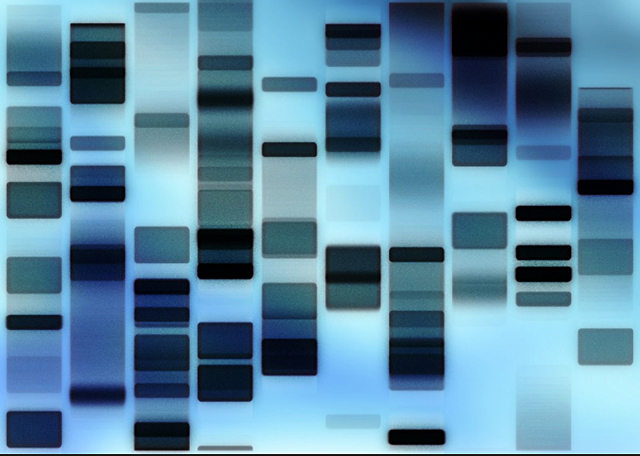 The image above is titled Trellis Too (2017), oil on canvas, 36×72 inches, diptych (image courtesy Lennon Weinberg, Inc.). 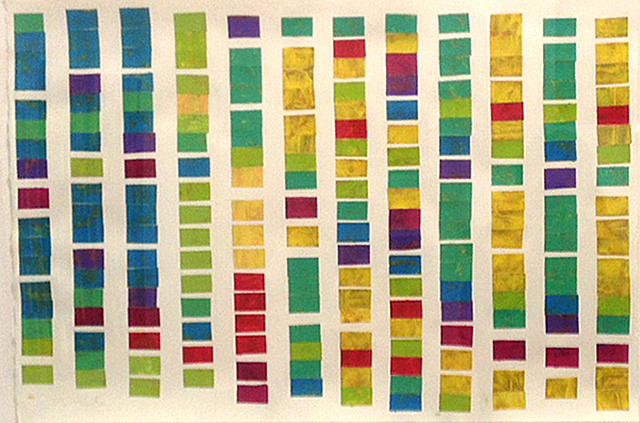 In his exhibition review (November 25, 2018),Yau said he counted at least three layers of marks compressed together in Trellis Too, saying the first layer is a patchwork of palest colors (durian yellow, cantaloupe orange and watery blue), the second layer includes glyph-like brushstrokes in different colors where the brush can be dry or full, the color can be saturated or faded, and one glyph often slides over another. The third layer is a drawing in black with a geometric web of tangled lines that hold the first two layers together. In his review, Yau writes he likes the way the painting asked him to pay attention to how the glyphs drift across the surface, as well as within the layers, how the paintings merge division and unity without favoring either because you notice similarities, changes and ruptures. I was lucky to have a conversation with Jill Weinberg Adams, the gallery director, and told her I am writing about women who do collage. She told me Meyers has a long-standing interest in collage and a unique collage esthetic. I was intrigued. 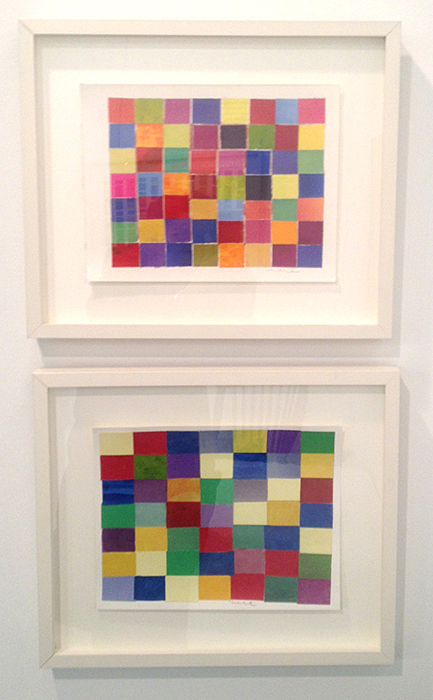 I saw two collages at the gallery – one was installed in the exhibition, and one was brought out from a closet. The first image (above) is titled Rearrangement Series 2 (2018), watercolor collage on paper, 15.75 x 12 inches (image courtesy of Lennon, Weinberg, Inc.) The second image (below) is titled Rearrangement Series 3 (2018), watercolor collage on paper (2018), 15.75 x 12 inches (image courtesy of Lennon, Weinberg, Inc.). Meyer makes a connection between her approach to painting and the collage process of cutting, pasting, and arranging elements, and says she isolates elements while building the whole painting, and wants viewers to experience each part of a painting as dynamically as they experience its entirety. The image above shows 3 sketchbooks with wide format, open double-page spreads on which Meyer added watercolor collage. 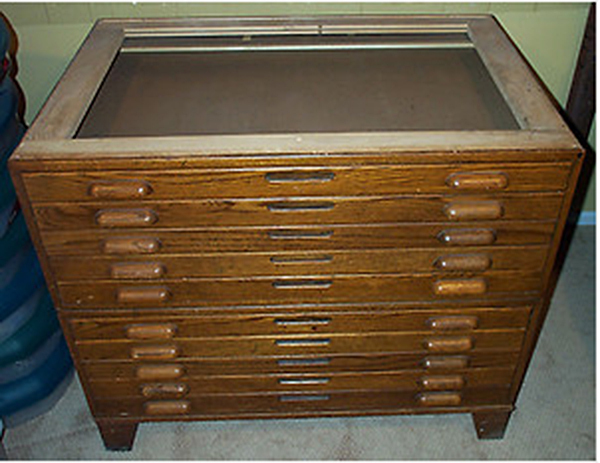 I learned Meyer is often at residencies and, while there, creates “Residency Sketchbooks.” The Metropolitan Museum of Art in New York reproduced one of Meyer’s sketchbooks. Jill Weinbeg Adams gifted me Meyer’s exhibition catalog, which includes reproductions of the artist’s painting, the sketchbook images (above), and text about the artist’s collage esthetic. At positjoiurnal.com I read Melisssa Meyers if very aware of the importance of collage in forming contemporary aesthetics, saying “As a method, collage encourages layering, shape-making and juxtaposition, all of which I apply to my work, from my paintings to multi-panel public works using expanded media (Photoshop). View a carousel of more watercolor collages in the Rearrangement Series at positjournal.com. I found the image above online. I believe it’s an early collage by the artist on what looks like a sketchbook double-page spread. You see Meyer’s calligraphic line in black on variations in warm and cool white. 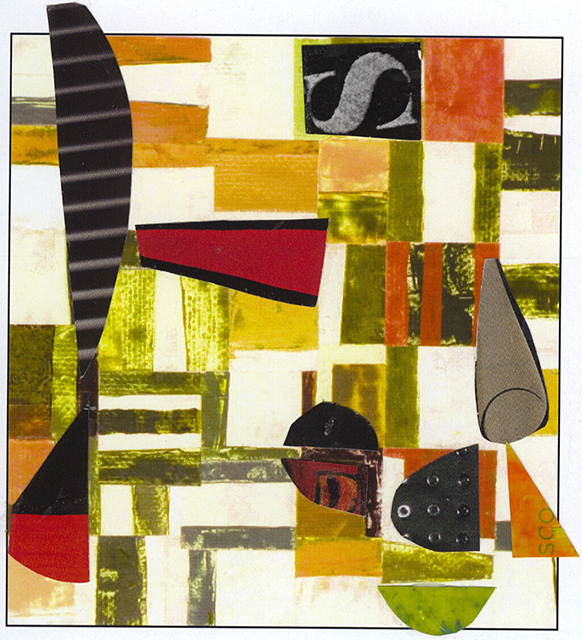 Notice the cut paper collage on top where the paper shapes mimic the shapes of the calligraphic line. Picasso and Braque did not invent collage. Many women made collage before the men did – but the men got the credit. In her mid-twenties, Meyer and fellow artist Miriam Schapiro co-authored an influential essay that linked the history of collage to traditional female hobbies like quilting and scrapbooking. They titled their essay “Waste Not Want Not: An Inquiry into What Women Saved and Assembled-FEMMAGE.” The essay was published in the magazine Heresies: Women’s Traditional Arts: The Politics of Aesthetics (Winter 1978). Meyer said she was always interested in scrapbooks made primarily by women in the 18th century. 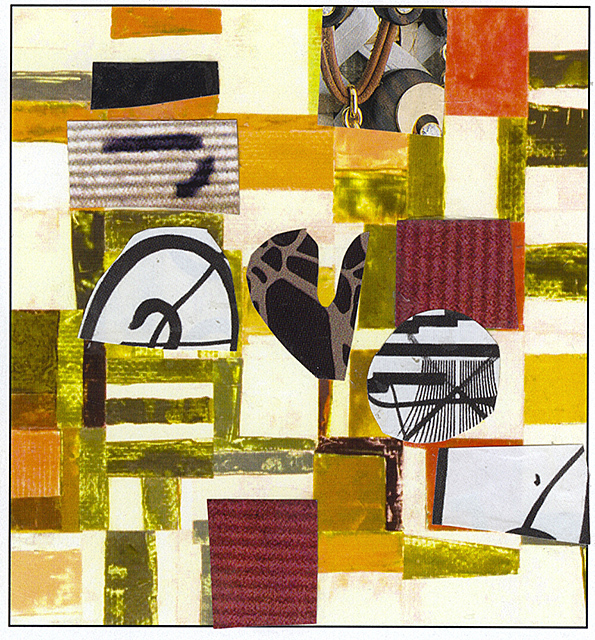 She discovered a collage sensibility in quilts. She valued the works of mid -20thcentury abstractionists, including Lee Krasner, who reused paintings and works on paper and recycled them into her large collages on canvas. See a facsimile of Femmage from the original Heresies publication at artcritical.com. 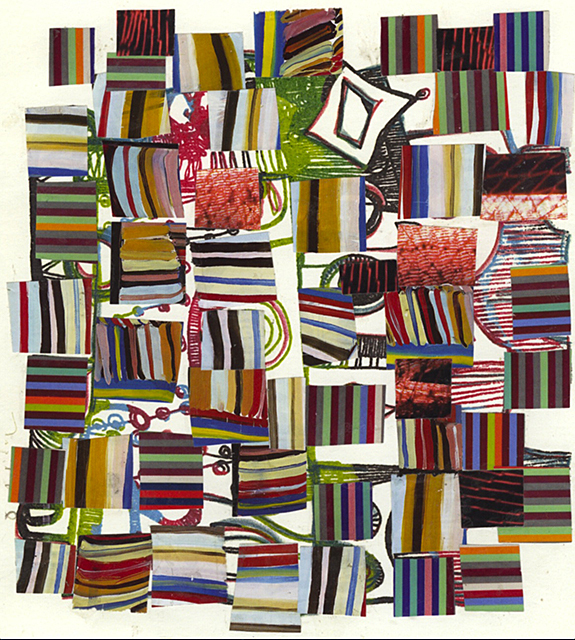 The image above is a collage by Miriam Schapiro, titled Miriam’s Life With Dolls (2006), fabric and collage on paper, 30×60 inches (image courtesy Flomenhaft Gallery, 547 W 27 Street, NY, NY). Schapiro (1923-2015) was a Canadian-born artist based in the U.S, an activist and pioneer of feminist art. Schapiro worked to resurrect the reputations of women artists who had been forgotten or dismissed by art historians. She was a painter, sculptor, printmaker, and a leader of the Pattern and Decoration art movement. Read more at the artstory.org. Meyer received a commission to create two large murals for the Shiodome City Center in Tokyo, Japan (completed in 2003). One mural was forty feet high; the other was sixty feet long. She worked with computer technicians with Photoshop to create the macquettes for the murals, directing how image files were scanned, how glyph images were layered, how colors were made saturated or muted, and how her painted calligraphic lines were made more or less transparent. Meyer admitted the scale of the murals posed a unique challenge. She knew she would have to radically enlarge the scale of her brushstrokes as she painted, and make each calligraphic shape more independent. She said the most basic challenge was to make the images work for viewers from all different vantage points. The commission got Meyers thinking about how her brushstrokes would move across the surface in the super-sized murals. She said working with Photoshop renewed her engagement with collage and profoundly affected her sense of space and her attraction to the esthetic idea of radical discontinuity. The image above shows a view into Meyer’s studio with her paints, brushes and books. Meyers says “ when I’m painting, I work intuitively, physically, thinking about brushwork as a kind of choreography, a dance that happens in the wrists and arms as well as the whole body. 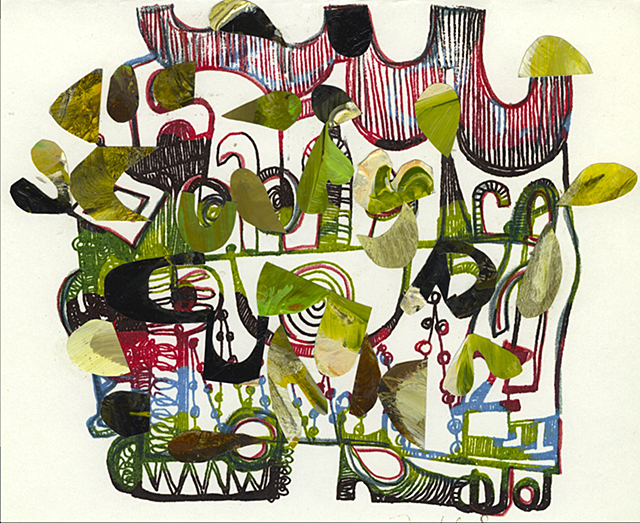 Meyer has exhibited in over forty solo shows, and has been included in group shows at the National Academy Museum and the Jewish Museum in New York. In 1997, the Metropolitan Museum of Art in NY published a facsimile edition of her sketchbooks. Meyer was awarded a Rome Prize from the American Academy in Rome and has received grants from the National Endowment for the Arts and the Pollock Krasner Foundation. Meyer’s work is included in the collection of the Metropolitan Museum of Art, the Museum of Modern Art, the Brooklyn Museum, the Solomon R. Guggenheim Museum, the Jewish Museum and many other public and private collections across the United States. Meyer has taught at the Rhode Island School of Design (RISD), the Art Institute of Chicago, and the School of Visual Arts in New York. She has completed public commissions in New York, Tokyo, and Shanghai, and currently has an eight by fourteen-foot ceramic mural in fabrication for the new U.S. embassy in Bishkek, Kyrgystan. I am so pleased to write this post about an artist who has a collage esthetic and welcome your comments. I open the blog with a review of the book $12 Million Stuffed Shark – The Curious Economics of Contemporary Art (2008) by Don Thompson. 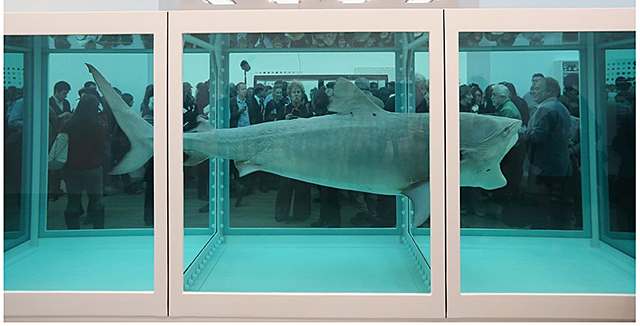 The $12 million refers to the price for a dead shark in formaldehyde by the contemporary artist Damien Hirst (British, born 1965). He was considered the most important member of a group known as the Young British Artists who dominated the art scene in the UK in the 1990s. Critics are now very dismissive of Damien Hirst. The image above is by Damien Hirst and titled The Physical Impossibility of Death in the Mind of Someone Living. All images are courtesy the Internet. 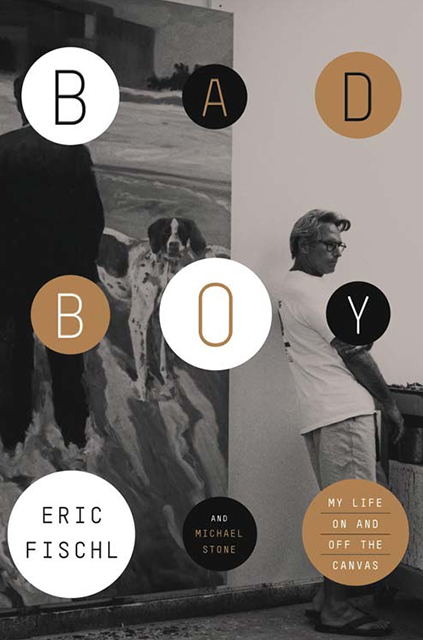 I just finished a new book titled Bad Boy: My Life On and Off the Canvas, by Eric Fischl (co-written with Michael Stone, 2013). It’s an excellent read. I recommend it to everyone who wants a glimpse inside the art world in the 1980s. The book is a narrative in Eric Fischl’s voice about his childhood (1948-1965), growing up in a dysfunctional family with an alcoholic mother, and about his career in the hyper-charged and competitive NY art scene in the 1970s and 1980s. That art world was a world of fashion, fame, cocaine and booze. The narrative is excellent. Fischl has a gift for conversation. The book includes images of his paintings and commentaries from artists, friends and collectors (including David Salle, Steve Martin and John McEnroe). The first page of the book is a bizarre recounting of a car chase, following Fischl’s opening night reception at the Whitney Museum of American Art for his retrospective (1986). He admits he was high on cocaine. The story tracks back and tells us about his childhood, how he got accepted at CalArts (a very prestigeous and selective art school), the intense competition among the students at CalArts, and how he struggled, post graduation, to find his style and become an important contemporary artist. His resume is a stunning list. Bad Boy (the book) is named after an infamous painting Fischl did titled Bad Boy (oil on canvas, 1981, 66×96 inches). The painting propelled Fischl to art-world stardom. I choose not to show the painting but you can see it online. Fischl writes about his style and concept. He chose figurative painting with bold, brushy strokes. 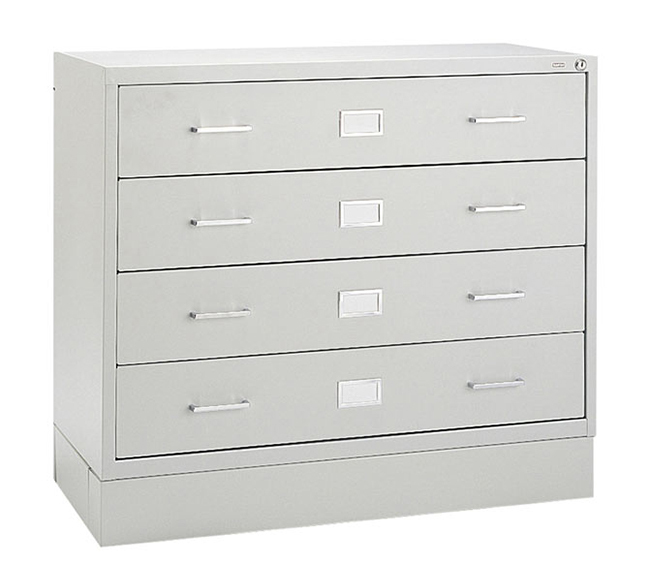 His subjects refer to his life and biographical details. I took notes when Fischl discussed the ways he approached his works. Fischl said he made split paintings (multiple panels) to explore the connections between time and memory and between physical and psychological space. He said he split the paintings to keep his creative juices flowing. He added: “I have consciously tried to make work that took fragments and put them back together – impressions and bits of memories collaged into foreign lands or suburban settings, all with the purpose of making them appear seamless. He said he was reliving his experiences as he was painting them, always at the point just before things fall apart. Fischl describes his life with the artist April Gornik, who he married. The book includes comments by relatives, artist friends and collectors that are interesting additions to the book. They give their insight and compliment Fischl’s commentary. The introduction says Fischl rebelled against conceptual and minimalist art that was in fashion in the time he started his career. He said his paintings became portraits that expressed angst and tension. The large oil on canvas (above) is dated 2011 and titled Self Portrait – An Unfinished Painting. 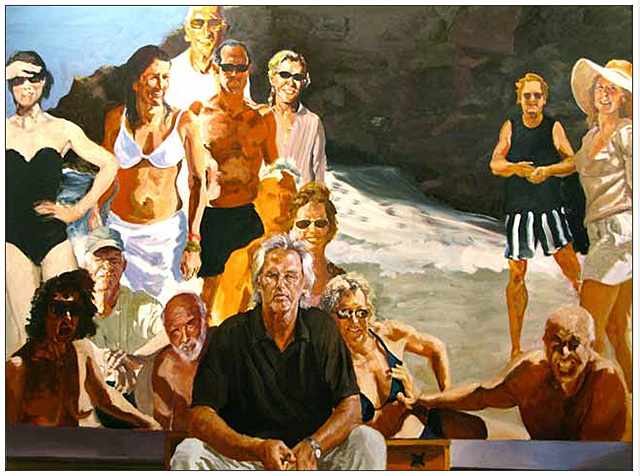 Many paintings by Fischl are large group portraits of friends at the beach. Fischl wrote: My whole career I’ve been trying to make paintings that people can relate to, respond to emotionally and not stand in front of scratching their heads. He doesn’t love contemporary, non representational art. He is sad that his work has been eclipsed by younger artists and new styles. I gave the book 4 out of 5 stars as a review. It’s a really good book – I do recommend it – but I didn’t like the way it ended. Delphine Barguidjian reviewed Bad Boy (see Scene, May 6, 2013). She asked Fischl: Do you think the art world has changed much since the 1980s? He responded: These days the institutions and galleries are less important, art fairs are more important. Short term, short hit, sensational aspect. That’s how people buy art nowadays – buy it fast and it doesn’t even leave their storage warehouse before they sell it off again. Fischl said he was uncomfortable with the fragmentation and meaninglessness in contemporary art, and singles out Jeff Koons and Damien Hirst as examples. Please add your comments if you’ve read the book and about whether or not you think Fischl’s art is (or was) controversial. 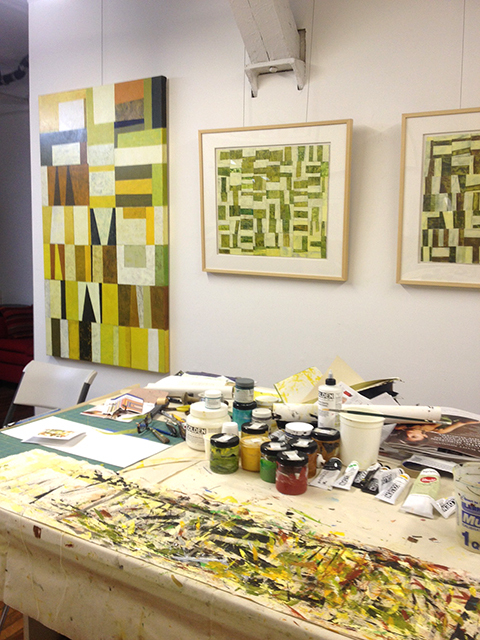 Next week I will teach a workshop in paper collage at Iona Collage in New Rochelle, NY. I will be a substitute for their regular teacher, and I want the class project to be fun, quick and easy to do – and engage them in making a collage right there. I will provide each student with a 6 x 9 inch exhibition postcard for them to work on. They will use magazines for source media, and work with scissors and glue sticks to cut and paste papers. I will show sample postcards with collage that I prepare for them. I will talk about the history of collage (and will not talk too much) while they are working on their project. Pablo Picasso and Georges Braque are credited with the invention of modern collage (1912-1914). The English word collage comes from the French words papiers colle (glued paper), a term coined by the Cubists. People who paste paper may also paste photos, fabric and 3D materials like wood, plastic, metal etc. Many books on contemporary art describe COLLAGE as a medium of surface planes that explore sub-surfaces. Many books also discuss collage as a medium that comments on waste and rampant consumer consumption. A lot of collage is about politics and identity. It’s always about narrative and media. Basically, I want to say that there is so much potential collage media out there to recycle into art. I think the idea of recycling and consumer consumption will appeal to this age demographic. How about creating cards with collage? I think we all have too much paper in our lives. But, I also think every piece of junk mail is a potential substrate (base) for collage, or can serve as paper to cut and paste onto something else. Do you get postcard announcements for consumer goods in the mail? Do you get glossy multi-page home goods and fashion catalogs in the mail? It’s all potential collage media. In my collage classes, I talk about 3Rs – reuse, repurpose and recycle. What about the holiday cards you received this year? Don’t throw them out. Recycle the castaways and use collage to create your own work of art. Cover the base with a little collage or cover it with a lot (but leave a little of the original card peeking through) to show the juxtaposition of the old with the new media. Last year I was gallery hopping in Chelsea (NYC). It was the closing day for the exhibition at one gallery, and I noticed a pile of really good, heavy weight exhibition announcement cards sitting on top of the counter where the gallery people sit. The cards were an elegant graphic (text) printed on lovely white stock. As soon as I found out it was the last day for the exhibition, I asked if I could have the cards. They said yes. I like the idea of theme and variation. I start with the same base image. It can be an exhibition postcard (from my exhibitions) or a greeting card I’ve reproduced from my collage paintings. Do you make your own cards? Do you reproduce your images into cards? Use the cards as a base for multiple collages. 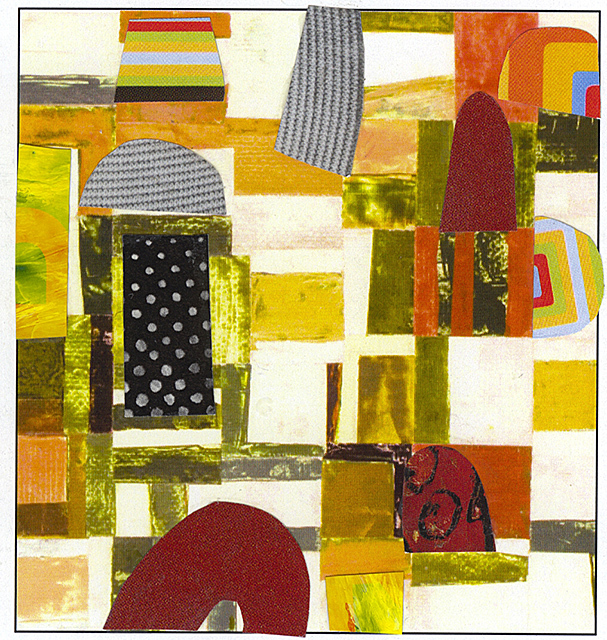 The new little collages can become the inspiration for new large works. All the images included in this post are my tiny collages made with magazine papers on top of my printed 2013 New Years card. The card is a reproduction of a large painted paper collage I did last year. The card is small, about 4×6 inches. I added up to 10 collage pieces (very tiny pieces) per card. The imagery on the original was very geometric, so I planned to use rounded shapes and circular lines as a counter-balance to the straight edges. I did about 20 collage on cards and sent the cards to people who send me hand-made cards. Wilkin curated an exhibition in Williamsburg, Brooklyn (NY) titled All That Remains, at the Picture Farm Gallery. Wilkin said: “One of the exciting things about collage is its primary use of discarded paper media which ultimately keeps it in motion, constantly changing like a chameleon. A quick look at the diversity of styles, concepts and technique found in contemporary collage proves it’s moved well beyond simply cut paper and glue. Thanks for reading. Please let me know how you recycle papers into art with collage. What Did You Do In 2012? I subscribe to Alyson B Stanfield’s artbizblog. You probably did more in 2012 that you are giving yourself credit for. I immediately followed Stanfield’s suggestion to take time and outline my own accomplishments for the year 2012. It was a wonderful exercise, both supportive (I got to see that I accomplished goals I set) and encouraging (I got to put in writing my goals for 2013). Getting to see contemporary art in a setting like Art Basel Miami Beach makes me happy. I was there for 5 days December 4-8, 2012. It’s an incredible experience, because the art you see ranges from museum quality blue chip art – to independent fine art dealer’s inventory from every country – to experimental and funky art that surely expands our understanding of what contemporary art is and can be. You get to see it all at Art Basel Miami. It’s an opportunity to meet and network with artists, gallery people (who were very friendly and accessible), and collectors. I attended programs, openings and free events. It was non-stop. In the image above, I am standing in front of what I call a dimensional collage. The image was taken at one of the large art fairs. The image is courtesy of Mary Hunter (my artist friend who met me in Miami, FL for 5 days to see all the shows). I will write about the fairs, the program Conversations (with artist Richard Tuttle in dialog with Chris Dercon, Director of Tate Modern, London), and a visit to the Rubell Family Collection in upcoming blogs. What was the single best thing that happened to your art career in 2012? I will write about that in an upcoming blog. Hint: it was a huge undertaking and it was worth it. I recommend you do your own Year-End Review at the Art Biz blog site. I include the final 5 here because they are so important. I think you will agree. (5) Start blogging: Write regularly and consistently. My goal in 2013 is to write blogs about collage that will become content for a book. Alyson Stanfield recommends artists blog about their art to establish their credentials as an expert. That sounds good to me (no matter what the subject) – because it helps you understand your subject in a deeper way, and the blog provides a place for dialogue with your fans, and makes you more search-engine friendly. (4) Find ways to get your work out there. It’s critical for you to exhibit your art. (3) Find ways to communicate about your art. Words can connect your art to more art viewers. (2) Your contact list is your most valuable asset (keep it current and active). (1) Get into the studio and make art! I have a copy of Stanfield’s book I’d rather be in the studio. It’s an excellent book that is perfectly titled for the dilemma studio artists face – because we are always juggling studio time (what we want to do and where we want to be) with the need to devote time to being out of the studio (marketing, seeing art at museums and openings, networking, writing, updating career and contact information, etc.). New Goal: In 2013, I plan to send out my newsletter Notes from the Studio more regularly. Its focus will change and be more about what I do in the studio (maybe show works in progress), about juggling time, marketing triumphs, and improving social media skills. 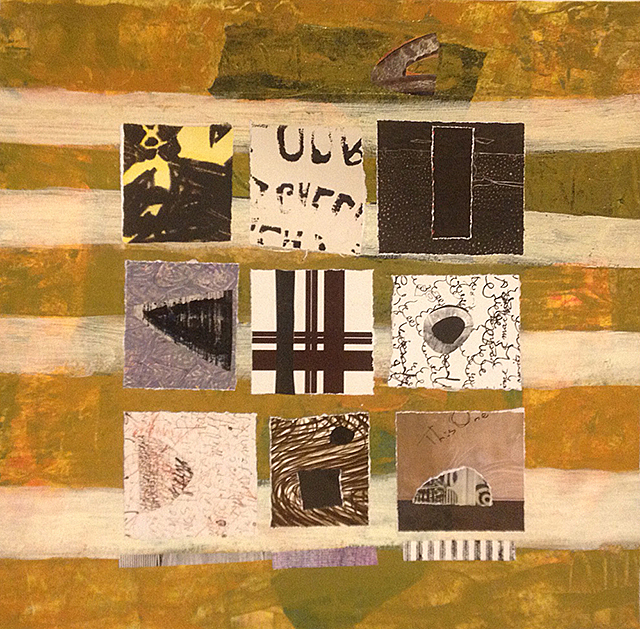 I will always include links to my blog Art of Collage because my studio practice is collage and I teach collage classes and workshops. They are always related. My studio practice keeps my life centered. I teach collage because my purpose is to help people enrich their lives with art (and through making art). I hope you will sign up to receive the news. Thank you for reading this post. Let me know how you did in 2012. 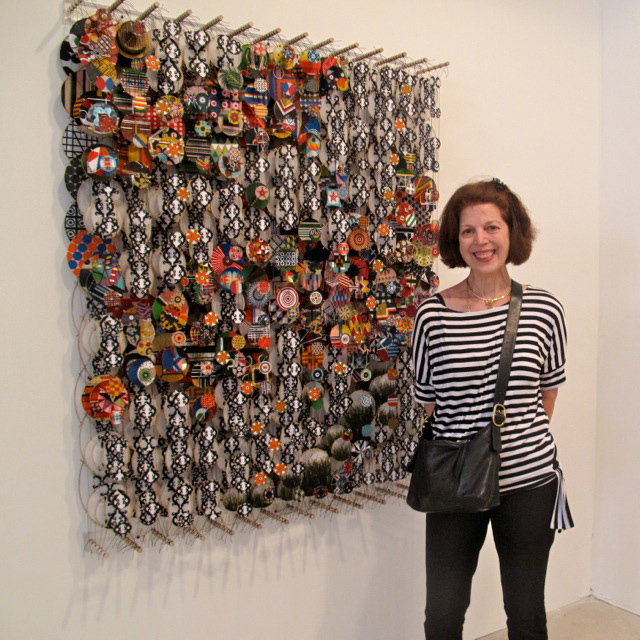 I planned to post a blog about my 5-day trip to Art Basel Miami Beach (Dec. 5-9, 2012). It was an amazing opportunity to see contemporary art. I couldn’t write about the wonderful art in Miami, because I am upset about the tragic events that took place at Sandy Hook Elementary School in Newtown, CT last week. 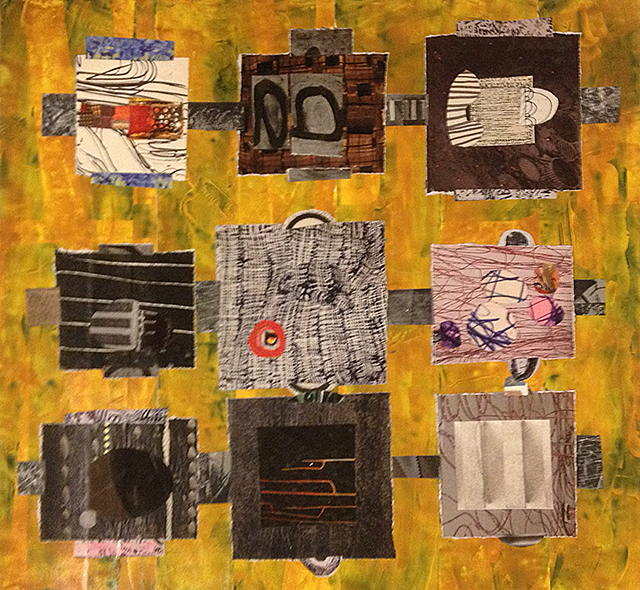 Because blogs need to be posted regularly, I found another way to get past my writer’s block – by going to my studio and making a sample collage for a workshop I will lead in April at the Newark Museum. It was something to do, and after I did it, I knew I could write about it. Making art makes me feel happy (happier). 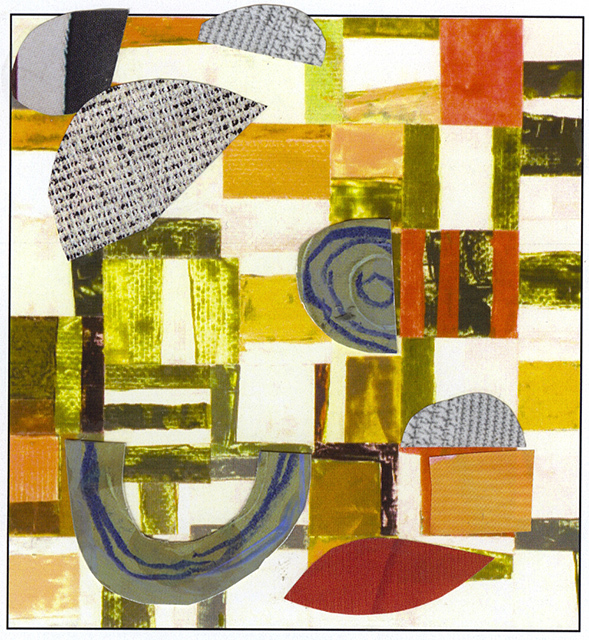 I painted papers and collected magazine papers in bright colors and geometric patterns for the sample collage. I wanted to create a palette of painted papers in green-blacks, reds, and red-blacks and coordinated magazine paper in red and black stripes. The Newark Museum workshop is titled Stargazing, Collage and You. It’s scheduled for Saturday, April 27, 2013 from 10-4, and is offered in conjunction with the Museum exhibition African Cosmos: Stellar Arts (February 27-August 11, 2013). The African Cosmos exhibition is currently at the Smithsonian National Museum of African Arts in Washington DC and will travel to the Newark Museum. See the Smithsonian website for images and wonderful text about the exhibition. The website introductory page shows an image of a painting by the artist Gavin Jantjes (b. 1948, South Africa). It’s acrylic on canvas and was purchased by the Museum with funds provided by the Smithsonian Collections Acquisition Program (see image below, image courtesy: the Smithsonian National Museum of African Arts). The artist rendered dancing figures in a style similar to ancient rock paintings from southern Africa. The Smithsonian website includes many images, including the image below – the stars of the Pleiades cluster, also know as the Seven Sisters (seen from the Cassini spacecraft. Image: NASA). Only a few of the stars seen here are visible to the naked eye on earth. The Smithsonian website also includes links to information about celestial deities in the time of the Pharaohs, cosmic models, celestial guidance, and more. You will also see African sculpture. The image below is a sample collage I prepared with magazine and painted papers, titled Dancing With the Stars. The papers are glued onto 14×11 inch Bristol paper (the substrate). Following are sample collage papers. 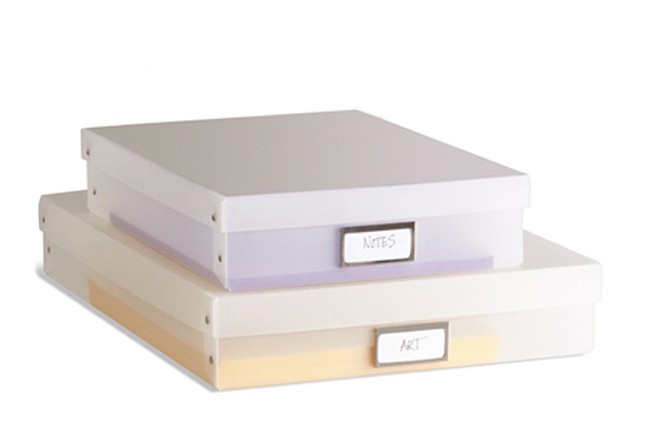 I plan to demonstrate different ways to organize, paint and embellish papers at the workshop. 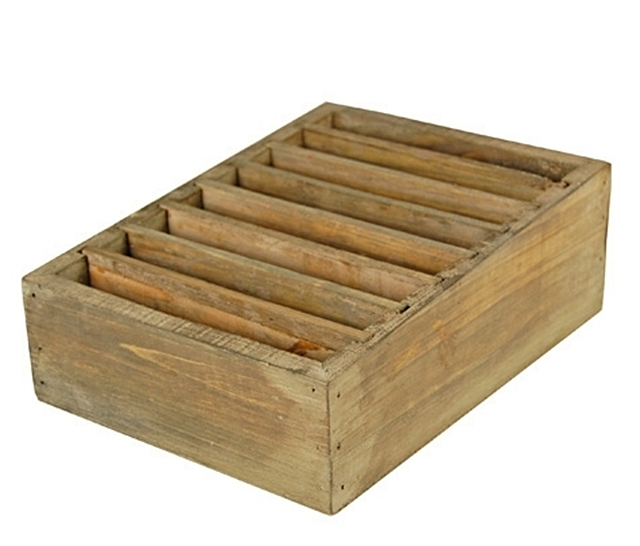 We will use ordinary materials that are inexpensive and easy to find. The image below is green construction paper painted with a mix of green and black acrylic paint applied with a palette knife. I will bring additional samples to the workshop and demonstrate the process so that participants can create their own palette of papers for collage. Notice the texture in the painted papers, and makes the final collage much more interesting. We save a lot of money when we create our own papers. We also make our work more personal. On the red image below, I made scribbled marks with 3 crayons (held together in my hand) on plain red construction paper and painted over the scribbles with acrylic. It’s a crayon resist process. The image below is red construction paper painted with red acrylic paint and overpainted with a second coat of black acrylic paint that was scratched into while the black paint was still wet. I will encourage people to bring their own magazines to the workshop, especially if they want to use specific imagery in their collage. I will discuss how to play with images, textures and patterns. Collage is about juxtaposition. Many times, people don’t see the potential of images until the images are cropped. I will demonstrate how to cut, tear and assemble the papers into new images. I think the photo of food (below) came from Real Simple magazine. I’ve included it here to demonstrate that all images have possibilities. The image below includes small pieces from several different magazines, including ArtForum and W. I planned to combine the triangles into points on a star to collage into the background. The funny face is assembled with about 5 pieces of paper and is only 2 inches high. It was going to be the head of the figure stargazing at the Pleiades Constellation. The magazine images below are backgrounds papers cut form fashion photos from W magazine. I wanted stripes in reds and blacks. The fashion magazines now show a lot of geometric patterns. 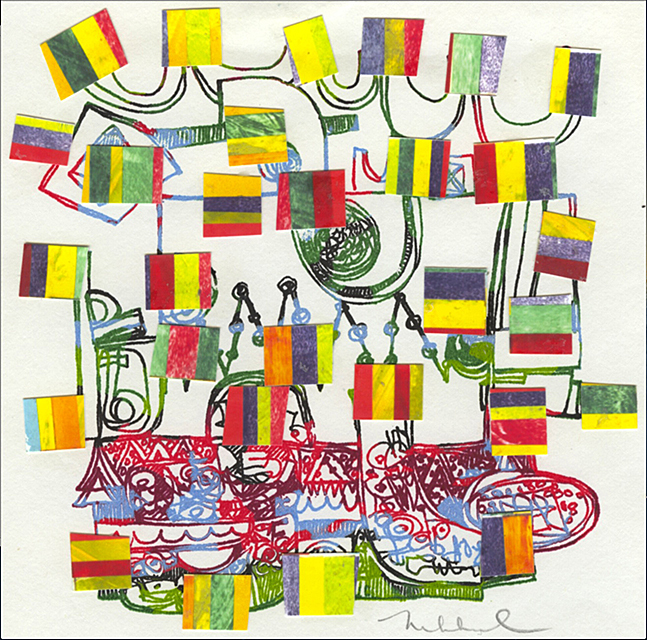 The striped papers became the body, arms and legs of the figure in the collage. The black paper on the bottom of the image (above) was cut up into the small stars for the constellation. In addition, I drew 5-pointed stars freehand and cut them out, cut out a crescent moon, and glued them around the figure onto the collage. It was a challenge to glue down the tiny white stars. I planned the collage in advance and did 2 simple drawings to determine the size and shape of the figure, the placement and direction of the of the arms and legs. I wanted to know in advance how tall the figure would be in relation to the background paper, and the size of the sky in relation to the size of the figure. See the drawing above. I planned to make the background in two sections and cut a piece of magazine paper for the top portion. It’s a section of an abstract painting reproduced in ArtForum magazine. The bottom section is painted paper. I created the figure from painted and magazine papers cut into circles, triangles and angled rectangles. The figure was placed in sections (arms first) and glued on top of the background papers. After the figure was in place, I added a crescent moon and 5 pointed stars onto the background around the figure. The tiny cutout shapes that became the Pleiades constellation were added last. See the finished sample collage above.